Typically, January is the coldest month of the year. But just because the weather is dreary, it doesn’t mean your fashion has to be. 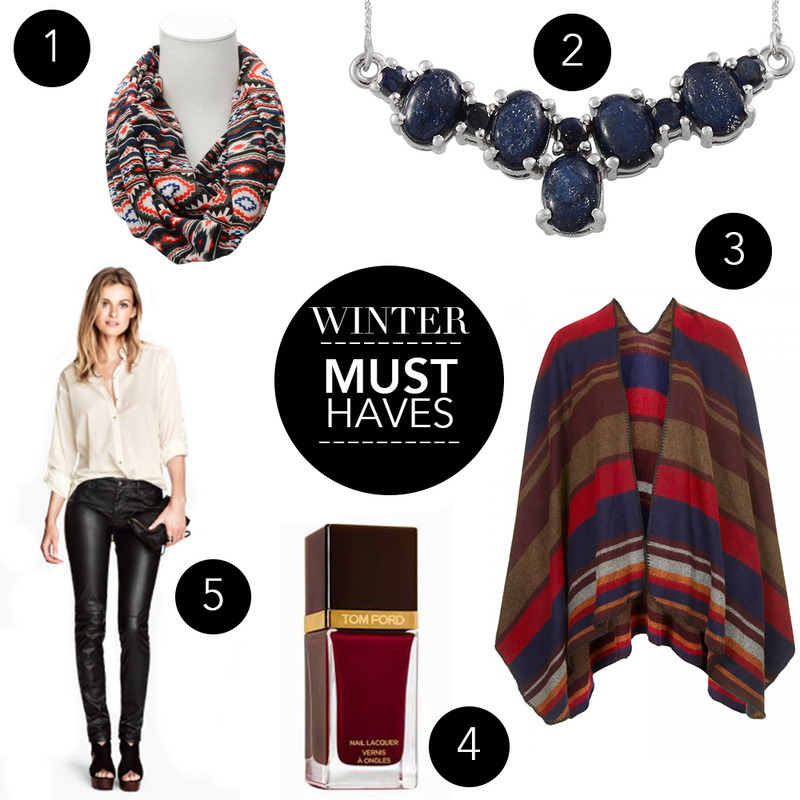 Join us as we list our top winter must-haves! A scarf is an essential accessory for cold weather. It’s also a really great way to jazz up your winter style, especially since your coat covers your charming outfit half the time. Go with a printed, fun design like this Aztec print scarf by J Francis. Its mix of geometric prints in multiple colors will draw attention to your face and add flair to your winter coat. Whether you’re meeting your friends for hot chocolate or going on a date, bold jewelry is a style that you can try anytime. A stunning piece like this sapphire necklace is an excellent way of turning a simple outfit into a stylish ensemble. Check out our Necklace Guide if you need help deciding which necklace looks the best with the neckline you’re wearing. Update your coat this year with an old fashion favorite: the cape. Capes have definitely made a big impression on the fashion world this season and for good reason. This chic piece will do wonders for the simplest outfit. Transform a casual top and jeans into a fresher look in seconds with this vintage buckle front cape. For more fashion tips on winter coats, look for our Coats Guide this Saturday! Pantone has announced Marsala as the color of the year for 2015. It’s a slightly muted wine shade that’s winter-friendly. Incorporate this trendy deep hue into your everyday style by pampering your nails with the Tom Ford Bordeaux Lust nail polish. This luxe nail polish features bendable coating and delivers high coverage and shine while staying color-true throughout wear. Whether they’re real or faux, leather leggings are a refreshing alternative to the legging trend. This material makes for an inherently dressier option than cotton. Try H&M’s imitation leather pants that feature mock pockets in the front and in the back. Keep it classy by pairing these stylish bottoms with a roomy top and high pumps.